Chanel Vendetta is a deep, vampy purple with red and blue shimmers. It looks purple in the bottle, but once it's on the nails, it is nearly black. Indoors, the shimmers basically disappear, leaving it looking more creme-like, but outdoors, Vendetta takes on a more glow-y quality, with the shimmers sparkling in the sunlight. 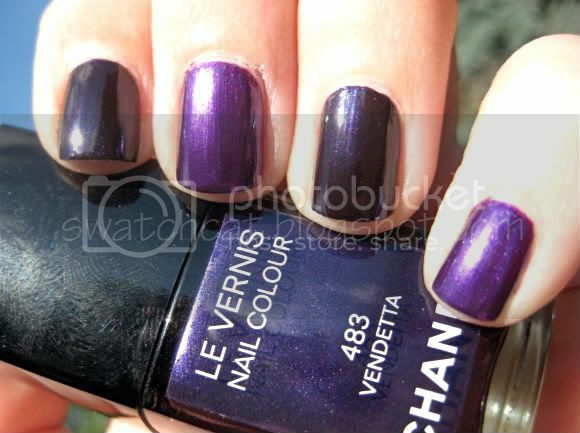 Vendetta is part of the permanent collection and is available for $25 at all Chanel counters and on chanel.com. 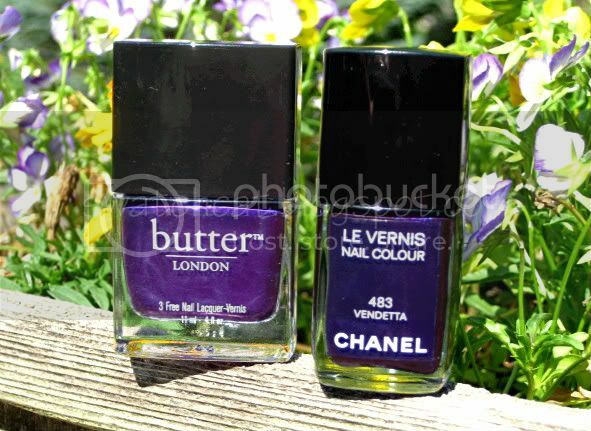 A reader asked how Vendetta compared to Butter London HRH. Both have the same red and blue sparkles, but that is where the similarities end. 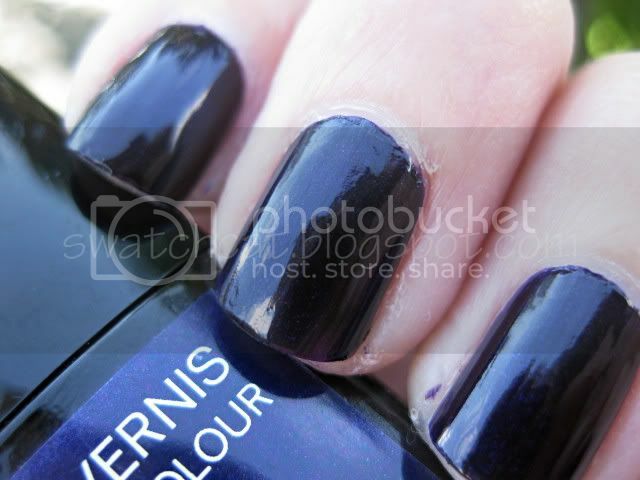 Vendetta is a very dark, blue-based purple, nearly black. HRH is brighter and more red-based. 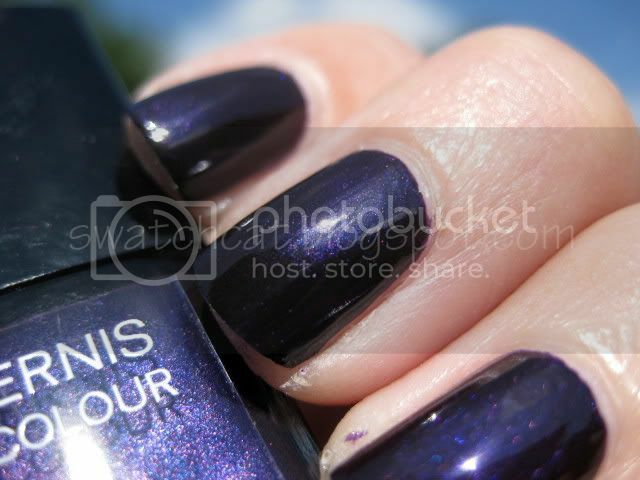 See here for my original swatches of HRH. 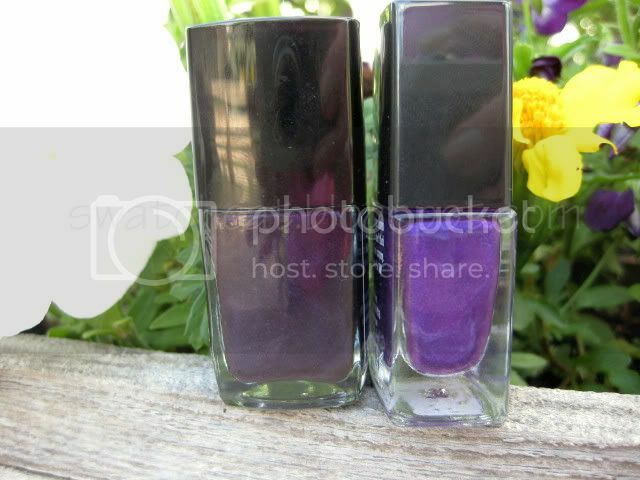 If you love purples as much as I do, these both have a place in your collection. I love purples as well and this too are amazingly pretty! Oh thank you thank you! :D Just seeing them side by side makes them seem so different! I do love purples, and I adore the vibrance of HRH! Sometimes I get a bit sulky when some friends think Vendetta is black on my nails! It takes every muscle in my body to stop myself from dragging them outside into bright light and wiggling my fingernails at them 1 inch from their face to show them the beautiful microshimmer! Maybe HRH would be better for my health! I think I like the butter London one better! Could you recommend a good Sapphire shade of nail polish? It's my birthstone and the color of my rings...I've been wanting to paint my nails sapphire with silver glitter for weeks now! i like that purple and the style can be unique I never saw that before!